The Coleoptera is the most diverse order of living organisms. The numbers are extraordinary - the more than 350,000 named species represent about 40% of all insects and 30% of all animals. There are at least six times as many beetles as vertebrate species and 90 times more than the number of mammals. The order is usually divided into four suborders (Archostemata, Myxophaga, Adephaga and Polyphaga) and about 150 families. Perhaps the single most important factor in the success of the Coleoptera is the development of the elytra, which protect the folded hind wings, permitting the occupation of enclosed spaces and hidden habitats by adults. The resulting subelytral space, enclosing most of the spiracles, reduces water loss through transpiration. Beetles live in almost every conceivable terrestrial and freshwater habitat and even in some marginal marine ones. They thrive in plant foliage, flowers, fruits and seeds; in living plant tissue in galls, stems and roots; in soil, leaf litter, under bark and in rotting wood; under stones and in fungi; in dung and carrion; in the nests of vertebrates and social insects; in stored foods; in running and still fresh waters; in saline ponds and estuaries; in sand and mud along water; among debris along the ocean and in caves. Many species live in fresh water, either in the larva stage or in both larval and adult stages. Many adults, especially in the Hydrophilidae and Elmidae, have ventral patches of fine setae (plastrons) that trap air bubbles for use in breathing. Larvae have various sorts of external gills and siphon-like spiracular tubes. Most species of beetles probably eat living plant tissue, but many feed largely on decomposing material acted on by fungi and bacteria. Others are fungal feeders. Most phytophagous species belong to the Scarabaeoidea, Chrysomeloidea and Curculionoidea, and the families Buprestidae, Elateridae, Bostrichidae and Anobiidae. Carnivorous beetles are common, and include almost all Adephaga and Polyphaga such as the Hydrophildae (larvae), Histeridae, Staphylinidae, Elateridae, Lampyridae, Cantharidae, Cleridae and Coccinellidae. Most are general predators, but some are more specialized; for example, Coccinellidae feed mostly on aphids and coccoid Hemiptera and the Lampyridae feed mostly on snails. Beetles are of immense ecological and economic importance. Many are vital in the cycles of decomposition of plant and animal matter. 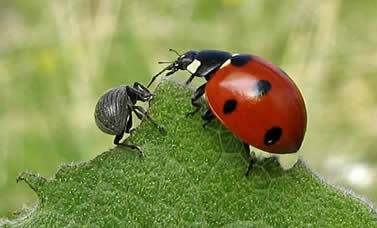 Others are predators of insects and other invertebrates that damage crops and other plants. Many beetles feed on the foliage and roots of plants, causing much damage to crops; they can kill huge tracts of valuable forests in a short time. Others damage our wooden homes, our furniture and many kinds of stored foods and other products. In this section of E-Fauna BC, we present detailed information on the Beetle Families found in British Columbia. We provide keys for identifying beetles found in the province, as well as checklists of the families in both taxonomic order, and in alphabetical order. Importantly, we provide detailed descriptions of each family. Finally, we provide a glossary of terminology used throughout our discussions of beetles. Follow the links below to access this information. Beetles are tiny to very large insects (about 0.4 mm to 130 mm long) of variable shape and colour, but mostly strongly sclerotized, compact and more or less flattened so that the lateral sclerites are mostly ventrally placed. The compound eyes are normally conspicuous; ocelli are almost always absent. Antennae usually have 10 to 14 segments (most are 11-segmented) and are variable in form - threadlike, comblike, beaded, sawtoothed, elbowed or enlarged at the end in various ways. Mouthparts are normally of the chewing type; a very few beetles have mouthparts modified into a sucking tube. Adults normally have two pairs of wings, the front ones (elytra - singular, elytron) are usually hard and shell-like, folding over the back and meeting in a straight line to make stout covers for the folding, membranous second pair, which are used for flight. Some species have reduced wings. The legs are normally strongly sclerotized; tarsi usually have 3 to 5 segments. Beetles have both a larval and pupal stage. Larvae have sclerotized head capsules, chewing mouthparts, distinct antennae and, usually, ocelli. There are no labial silk glands. Thoracic legs are the rule; sometimes they have fewer than the usual 5 or 6-segments, or are absent. The abdomen lacks legs, or rarely has one or two pairs of prolegs. The pupa normally is exarate, with the appendages free, but sometimes they are fused to the body (obtect type). In preparing this account of the beetle families of British Columbia, we have been heavily dependent on the descriptions in the recent two-volume work on American Beetles (Arnett et al. 2001, 2002). We have followed the family classification and the order of families given in these volumes. The key to families is adapted from that presented by M.A. Ivie in Arnett et al. (2002). We have tried to use terms that are user-friendly and more easily understood by non-entomologists. For example, we use fore, middle and hind coxae instead of procoxa, mesocoxa and metacoxa. We also use the term "segment" for the divisions of the antennae, legs and palps, although we realize that this is morphologically incorrect. Nevertheless, in many cases we have accepted standard entomological terms in the keys and descriptions: these are given in the glossary that is appended. In the key to families we have, with few exceptions, only included the families known to occur in British Columbia. In this and the taxa included in the descriptions, we have been guided by those listed in Hatch (1953-1971) and Bousquet (1991). We realize that both of these publications are quite dated, and no doubt many more taxa actually occur in the province. Hence, it is to be expected that revisions will be needed, as soon as an update to Bousquet (1991) is completed. In this section, we have included only an outline drawing of one species in each family. This may not represent the form of all the taxa included, especially in the larger families. Illustrations in Arnett (1973), Arnett et al. (2001, 2002), Hatch (1953-1971) and White (1983) will help give a better idea of the diversity in this very large Order of insects in this region of Canada. Finally, when there is a comprehensive monograph for a beetle family in Canada, we have indicated this at appropriate places in the text. Arnett, R.H. Jr., 1973. Beetles of the United States. A manual for identification. American Entomological Institute, Ann Arbor, MI. 1112 pp. Arnett, R.H. Jr. and Thomas, M.C. 2001. Volume 1. American Beetles. Archostemata, Myxophaga, Adephaga, Polyphaga: Staphyliniformia. CRC Press, Boca Raton, FL. 443 pp. Arnett, R.H. Jr., Thomas, M.C., Skelley, P.E. and Frank, J.H. (Eds.) 2002. Volume 2. American Beetles. Polyphaga: Scarabaeoidea through Curculionoidea. Boca Raton, Fl. 861 pp. Bousquet, Y. (Ed.). 1991. Checklist of Beetles of Canada and Alaska. Research Branch, Agriculture Canada, Ottawa, ON. Publication 1861/E: 430 pp. Hatch, M.H. 1953-1971. The Beetles of the Pacific Northwest. Parts I-V. University of Washington Publications in Biology. Vol. 16. White, R.E. 1983. A field guide to the beetles of North America. The Peterson Field Guide Series. Houghton Mifflin Co., Boston 368 pp.